Michael Smyth in the documentary “The Irish Pub,” directed by Alex Fegan. Even in Ireland, the past is fading fast. Irish documentarian Alex Fegan recognizes this and has preserved some of the country’s fading resources. 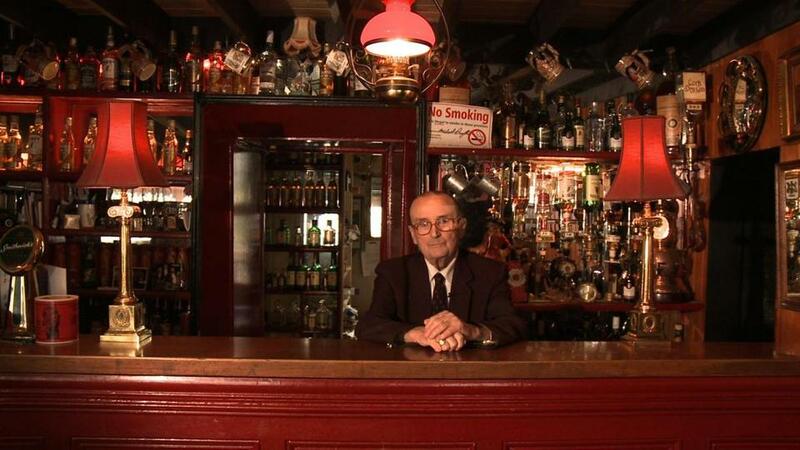 In 2013 he made “The Irish Pub,” a tour of the iconographic public drinking houses that are now falling victim to changing times; the film is as bittersweet as a well-poured pint of Guinness. His newest film, “Older Than Ireland,” focuses on a more precious commodity: the elderly. It’s about those born before the Easter Rising rebellion of 1916, which celebrates its centennial this year. “Older Than Ireland” screens as part of the Irish Film Festival, Boston (see Scene Here column, Page N8) on Friday at 7:30 p.m. at the Somerville Theatre. It opens at Kendall Square Cinema on April 22. Fegan, who will be in Boston for both screenings, recently discussed the film by phone from Washington, D.C., where he was taking part in the Capital Irish Film Festival. Q. At the beginning of the film, the first subject receives a check from the president of Ireland to acknowledge her 100th birthday. Would you say the country treats seniors well? A. That’s called the Centenarian Bounty, which is a check for 2,540 Euros [roughly $2,784 US] to everyone given by the government on your 100th birthday. I asked all 30 subjects, how do you feel being this old in Ireland? And they all felt happy. But one lady we interviewed ended up being on a hospital trolley for 24 hours because of the system. It was a huge media story. But I talked to her son and he said it was blown out of all proportions. So I would say that they are content, but it’s not perfect. Q. Did you think some held back on their darker memories — like bad marriages and harsh upbringings? A. They all thought that their childhoods were extremely harsh. There was a lady in Connemara who said that, though it was a beautiful place, you couldn’t live there. And that the teachers were absolute brutes. One gentleman had just a piece of bread to take to school to last the whole day. Many grew up in abject poverty. It wasn’t wonderful, but they didn’t know any better so they got through it. Q. One woman has surprising views on gay marriage. Did you get many to talk about their Catholic upbringing? A. In terms of the church, I had a preconception that a lot of the centenarians would be religiously dogmatic. Not all were. One woman says she believes in God, but she wouldn’t believe in the Catholic Church. Off camera, she said she went to one of the schools where there had been abuse. She said she didn’t experience any, but she thought one of the great things that has happened in the past few years was that it has been exposed. In terms of that, a lot of centenarians were wary of what they were saying. So you had to read a bit between the lines. Q. I found it surprising when one centenarian lights up a cigarette. That scene alone will get the film a PG-13 rating. Is she still doing well? A. She’s still fine! She’s 104 now. And the woman who never ate a vegetable in her life is doing well, too. Her son is 84 years old and she still takes him shopping for clothes.